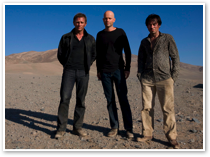 Cerro Paranal, home of the ESO Very Large Telescope, has been chosen as one of the settings for the newest James Bond movie, Quantum of Solace, the 22nd in the series. The Bond production was attracted by the special location and the exceptional architecture of the award-winning Paranal Residencia, a true oasis in the desert. In addition to the shootings at the Residencia, further action will take place at the Paranal airstrip. Follow the links above to find out more about Cerro Paranal and the ESO Very Large Telescope (VLT), the world's most advanced optical observatory. Explore the astronomical universe from this mountaintop in the Atacama Desert and discover the unique Paranal Residencia.